The first round of the 2014 NBA playoffs has begun, which means the league's superstars are being featured not only on the court, but off of it as well. Basketball fans will have to make a special effort to avoid the steady stream of commercials or print ads featuring LeBron James, Kevin Durant and Dwight Howard over the next several weeks. For the most part, NBA players are prone to churning out standard advertising fare -- a Nike commercial here, a McDonald's billboard there. But some NBA stars have taken more unconventional routes when it comes to brand affiliation. It's rare that a professional athlete exudes the kind of natural comedic chops Los Angeles Clipper Blake Griffin has in his endorsement career. His campaign for video game rental service GameFly builds upon the tone of his more famous Kia series, but is a bit more daring in its approach. Slip a 6-foot-10 power forward into a jet pack? No problem. Griffin still looks uber confident making his pitch. Brands looking to push the envelope with their athletes should use this piece as inspiration. There's nothing particularly unique about this deal, until you consider that Miami Heat guard declined re-upping with Nike to sign with the Chinese shoe company. 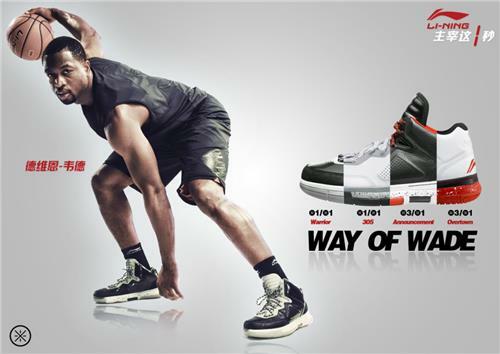 As a result, Wade's international profile has increased considerably as he has become the face of Li-Ning. He was also given an equity stake in the company, which means that if things go well, Wade's deal could end up being the most lucrative in sports history. Could this move herald a stampede by more NBA players to brands outside of Nike and Adidas? Not all endorsement deals with NBA players involve big national (or international) brands. The local markets have traditionally been a way for less-prominent athletes to bring in extra revenue. Trail Blazer big men LaMarcus Aldridge and Robin Lopez created a bit of a stir last year with a series of irreverent ads for a Portland-area car dealership. Viewers seemed to either love or hate this commercial, which contributed to its viral impact. Houston Rockets small forward Chandler Parsons is the first professional athlete to sign with lifestyle brand Buffalo Jeans. The campaign targets sports fans and gym-going guys by showcasing Parsons' rugged good looks and hip sense of style. A lot of players would shy away from this type of ad since the macho world of the sports locker room can be a place of ridicule, but Parsons pulls it off. San Antonio Spurs point guard Tony Parker joined the Tissot ambassador team in 2010. Since then, the watchmaker has attached his name to several of their brands. Parker's international flair (he's the captain of the French national basketball team) and his Hollywood connection (he was once married to actress Eva Longoria) makes his association with the luxury brand seem natural. Scribble Content Tip: Using a news event as a hook is an effective way to make brand content more compelling. In this case, the NBA playoffs provide a thematic bridge to the five marketing stories told above. Just be sure to do the research to back up your narrative. Also, link back to sources to give readers context so they can dig deeper into the subject matter if they want. Click here to find out how ScribbleLive can strengthen your brand.